The card has been constructed in CAP2. 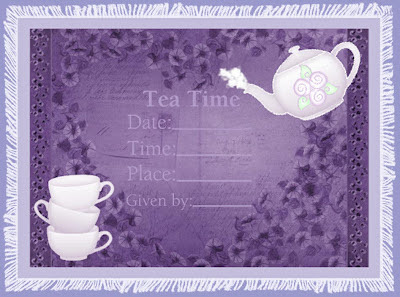 The background is from Debbi Moore's Shabby Vintage Papers CD. The invitation, teapot and cups are from Pam LeFors Tania's Tea Party digikit. The 'steam' and fringe are CAP2 brushes. Well done Caroline - this is the first one done as an invitation and it's a brilliant idea. I think Cynthia would definitely come if you sent her this beautiful purple invite. Hi Caroline, this is a great card, love the steam escaping from the spout. Beautiful backing papers and your fringing is a perfect finishing touch. Thanks for joining us at CD Sunday again. Gorgeous Invitation I like the tea pot, cups and the colours, Thanks for joining in with us at CD Sunday this week. Brilliant Caroline , now that is thinking outside the box and i love it. Thank you for joining us at CD Sunday this week. Liking this one Caroline, thanks for sharing this with us at CD Sunday this week. A great idea Caroline and the steam is a nice touch. Lovely idea Caroline. It took me a moment to see the heart in the background.